Panicked scroll-wheeling aside, the game's mouse and keyboard support is pretty good. Monster Hunter: World is out on PC, and its weighty action plays surprisingly well on a mouse and keyboard. This is one Japanese PC port you don't need a controller to play, but you will want to tweak some settings before you go out on a hunt, mouse in hand. The mouse and keyboard controls are almost perfect, but with a few sticking points that might tempt you to plug in a controller if you have the option. Here's an overview of how the controls work, and how to fix the few problems holding mouse and keyboard back. Monster Hunter can be a menu-heavy game at times and the experience of clicking around the menus with a mouse is superior to pad play. WASD movement feels right, though there's some drag when you're using the mouse to look around. I got used to it quickly, but you can adjust camera speed in the options if you find it irritating. However, I find there is still a touch of lag when looking around that makes the camera feel jumpy at high settings. Attacks are bound to left-click, right-click, and control, though if you have a thumb button on your mouse that will also trigger the control attack with the default bindings. If you want to assign something else to that button, change the "Mouse 4" binding in the options. Having all the attack buttons on a mouse works very well. 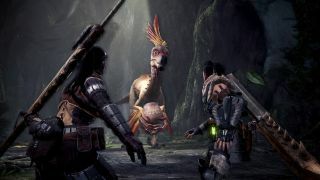 Monster Hunter: World's combos and special attacks are rarely complicated to execute—the most you have to do it press a direction and two attack buttons at once for some special moves. I was easily pulling off high-powered long sword combos on a Great Jagras after an hour, though re-angling attacks can feel awkward using WASD. An analogue stick gives you more precision versus WASD's eight directions. The rest of the movement control bindings show common sense. You run with shift, of course. You grab herbs and mushrooms with right-click when your weapon is sheathed. You roll with space. Dashing around on an expedition feels as natural with a mouse and keyboard as it does with a pad. You can rebind the keys to your preference as well. There are two main flaws with Monster Hunter: World's mouse and keyboard scheme. The first is lock-on. You lock with F, but the slightest movement of the mouse moves the lock to the next nearby creature. It's basically useless if that's how you choose to play Monster Hunter, though as someone who tends to batter monsters with wide swings and massive weapons, I never feel the need to lock on. The quick-use item menu is a bigger problem. In Monster Hunter you frequently need to take a second to chug a potion or sharpen your weapon. With a pad you can hold a button to bring up a radial menu that lets you flick a stick in the direction of the potion or item you want. Alternatively you can use the bumpers to cycle back and forth through your items. On mouse and keyboard you hold Q to bring up the radial menu, but then you have to use WASD to point at an item in the circle. This means your character has to stop while you try to select the right thing and, oddly, you can't select items in diagonal positions on the radial menu, only top, bottom, left, and right. Even these are clunky to access. Anjanath isn't going to wait around while you rummage through your bag. Fortunately, there's a solution. Unfortunately, it means scrapping the handy radial menu entirely. Under the Items and Equipment menu is an option to change the radial menu style to "keyboard" which converts the radial menu to an MMO-style action bar that uses number keys. By pressing F1 - F4 you can bring up different menus that have your items or gestures handily mapped to the number keys similar to something like World of Warcraft. It's workable, certainly, but reaching to hit F1 and then the 7 key in the middle of a fight still isn't as useful as having a properly functioning radial menu. Why it doesn't work with the mouse instead of WASD is a frustrating mystery. This is the main area where mouse and keyboard falls short of the pad experience. However, you can flick through your items using the scroll wheel. This can get tense when a dragon is trying to eat your face, but it's doable. If you don't own a pad, I wouldn't rush out to buy one just for Monster Hunter: World. I'm impressed by the amount of customisation you can find in the menus; you can even tune the camera speed separately for general looking around and movement while aiming. For ranged classes and anyone who loves using the slinger to pop paratoads, the precision of the mouse is welcome.